In modern times life is very demanding, challenging and full of hassles, deadlines, and frustrations. Stress is the normal response of your body to such events that make you feel threatened. It is also body’s way to protect you. Stress is always not bad and for some people, it has become a way of life. Stress within normal limits motivate you and help you to perform better. It sharpens your concentration and gives you extra strength in emergency situations to save yourself and come out of the trauma. But if you are constantly in stress, it affects your mind and body negatively. Beyond a certain point, stress may cause major damage to your health, behavior, mood, performance, and relationship. In modern life stress and anxiety are some of the worst health conditions that are afflicting you. Many of you do not realize it how much damage daily stress might be doing to your health, happiness, and ability to enjoy your life and your loved ones. Stress and anxiety may also be the leading causes of many types of health conditions and afflictions of your body and mind. 1. If you do not embrace the challenges and accept that change is the part of life you will be stressed. 2. If you feel sad, angry or afraid and do not know how to calm and soothe yourself then you become vulnerable to stress. The ability to control emotions can help to bounce back to the situation. 3. If you do not visualize the intensity of the situation, including how much time will need to cope with it and how to overcome the situation, you will be stressed. 4. If you feel lonely and isolated, your vulnerability to stress will be greater. 5. More importantly, your procrastination rather than the actual problems, demands of situations make you feel more stressed. Some of the sign and symptoms of stress are given below. But you should also consult your medical professional before arriving any conclusion as many of these sign may be due to other diseases also. It is very important for you to get familiar with the ways to reduce overall or momentary stress. You may follow right type of lifestyle, eating habits, getting enough sleep and regular exercises but equally important is not to shrug off mental hardship as it will also affect your health adversely. 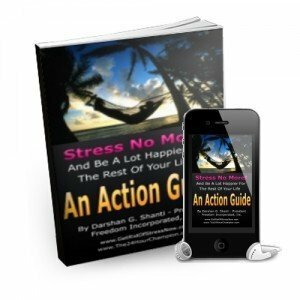 There is one complete guide on stress and stress management. The best way to reduce stress is the mental-physical phenomenon. Your mind notion of a danger or exigencies starts the physical cascade of the stress section. To minimize the stress you have to follow a healthy way of life in every respect i.e. physical aspects, mental aspects, emotional aspects, social aspects, and spiritual aspects.